Fresh, delicious pears start to appear in produce markets in early autumn and the pear cobbler cocktail is a fantastic way to enjoy this tasty fruit. The recipe takes the classic brandy cobbler and transforms it for autumn and winter entertaining; it makes a great addition to the Thanksgiving table. This recipe has classic style, based on the traditional cobbler formula that relies heavily on fresh fruits. It has a few modern twists, though. For one, we're pairing a dry sherry with a sweet pear brandy (or pear liqueur, if you like). It also requires a homemade cinnamon syrup. Yet, it is the drunken pears that steal the show and really make the cocktail something special. You really only need one pear to make a round of drinks, but having two pears of different varieties adds extra color and flavor to the pear cobbler. You might, for instance, have one Bosc pear and one Bartlett pear or even choose one green and one red Bartlett pear. The leftover pieces of pear can simply be a snack or you can reserve them and make your own pear liqueur. The nice thing about soaking pears in liquor is that the fruit picks up the flavor of the brandy. At the same time, it adds a little extra flavor to the brandy. Also, the brandy helps preserve the flesh of the pear so it will not turn brown, a common problem with fruits like apples and pears due to oxidation. An easy way to dice pears is to cut each pear into four or five thick slices. Stack the slices and make two cuts lengthwise, then a single cut in the opposite direction. Place the pear pieces into a jar and pour enough brandy over them so they are fully submerged. Cover the jar and allow it to sit in a cool place for 12 to 24 hours. There's no need to refrigerate it. When your drunken pears are ready, it's time to build the cocktail. For this, you will use the same brandy the pears were soaked in, which should be gently infused with a little fruit flavor. Combine the sherry, pear brandy and syrup in a cocktail shaker filled with ice. In a chilled glass, begin building the cobbler by intermingling crushed ice or small ice cubes with drunken pears and a few grapes until the glass is full. Strain the contents of the shaker into the prepared glass. Top with a few more drunken pear pieces and grapes if desired. Tip: Have a cocktail skewer or toothpick nearby so you can pick out and eat the pears and grapes. Though it's not a garnish, this is one time when you're actually encouraged to eat the drink's fruit. It's part of the fun, so ignore "proper" etiquette and enjoy your drunken pears. A trip to the liquor store should come up with at least one pear-flavored liquor option. Pear brandies tend to come in two styles. One is a true pear brandy that is distilled from pears rather than grapes. The other is a bit more like a liqueur that has been sweetened. The latter is rather common in many fruit brandies (apple, cherry, etc.) and tends to be a less expensive option. You can also look for a pear-flavored eau de vie. With the recent cocktail renaissance, many distillers are choosing to forgo the sweeteners that have been added to fruit brandies for decades. This means that true pear brandy which is no sweeter than the average brandy or Cognac is becoming more readily available. This is great news for our cocktails, though you can expect to pay more for these offerings. Quite often, to find a great pear brandy, you need to look to craft distillers. St. George Spirits and Clear Creek are two brands that produce very impressive pear brandies and they're available throughout the U.S. Also, look to the offerings of your local distillery because many of the smallest producers are making fantastic pear brandies. Another option, which will take more time, is to make your own pear-infused brandy. 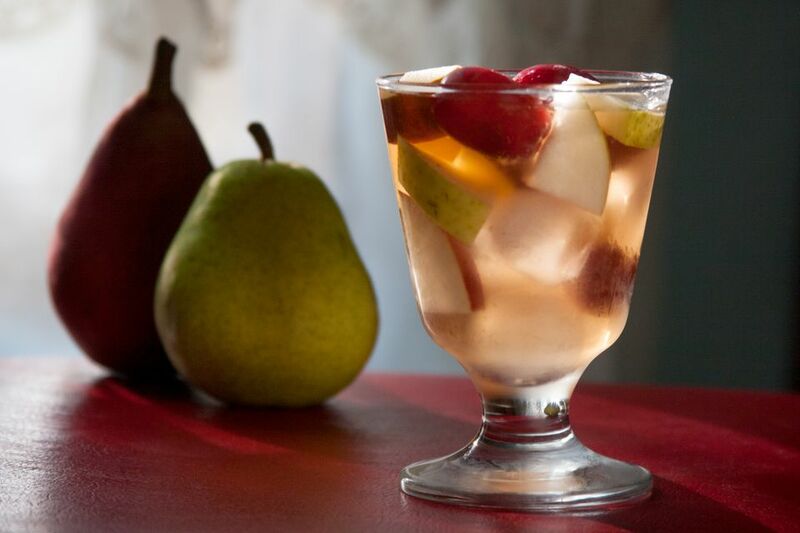 Simply choose your favorite bottle of standard brandy, slice up a few pears, and combine them in an infusion jar. To get the maximum flavor, the infusion should take about one week. Strain out the pears, and you have a tasty pear brandy without the sweetener. Pear liqueurs are certainly another option, but they are sweet (as all liqueurs are). If you choose to go this route, be sure to choose a fino sherry rather than an oloroso. Finos are drier and less rich, which will retain the balance with the sweeter liqueur. Today, you can find some fantastic pear liqueurs and top recommendations include Berentzen, Bols and Mathilde.